Hair follicle is basically the sac where your hair grows. There are sensory nerves fibers at the base of the hair follicle – these fibers cover the hair bulb. You stimulate these nerve fibers whenever you bend your hair. These nerve fibers make you know when your hair is bent or moved. There are also sebaceous glands that produce oil to condition the hair and the surrounding skin. Sometimes, you notice swollen hair follicle, which generally indicates an infection or an ingrown hair. Whatever the case, it is important to identify the cause and select an appropriate treatment option to eliminate swelling. 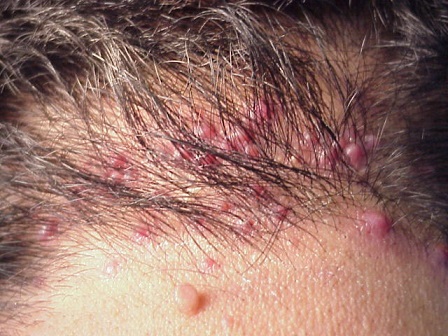 Folliculitis refers to an infection or inflammation of the hair follicles of the skin. If it is folliculitis, you will notice many hair follicles become affected. There will be small pus-filled pimples, each of which will look like a rounded, yellow-red spot. Sycosis barbae affects men and refers to a chronic folliculitis in the beard area. It is not easy to treat, especially when it affects the upper lip. This leads to the development of pustules in the hair follicles and the skin becomes quite painful and crusted. Hot tub folliculitis affects people who frequently use hot tubs. This happens when bacteria called Pseudomonas spp. grow in hot water. All you have to do is maintain your hot tubs and pools properly to avoid folliculitis. Gram-negative folliculitis occurs after using long-term antibiotics to treat acne. Different types of bacteria are involved in this case, so the treatment is relatively difficult. Pseudo-folliculitis looks like folliculitis, but happens due to ingrown hair. It looks more like little lumps but do not contain pus. You develop folliculitis due to a bacterial infection, but yeast and fungal infections may also cause this condition. Wearing clothes that rub the skin or shaving in the wrong way may irritate the follicles and lead to folliculitis. Sometimes, hair follicles are irritated or blocked by machine oils, sweat, or makeup and eventually swell. People who use a whirlpool, hot tub, or swimming pool that is not treated with chlorine are at a greater risk of developing this condition. You may also develop folliculitis if you have an infected cut or surgical wound. In rare cases, folliculitis is the outcome of diseases such as HIV or diabetes that leave you with a compromised immune system. Ingrown hair can lead to swollen hair follicle that looks like folliculitis. It refers to a condition when your hair curls around and starts growing back into the skin. You are at a greater risk of develop ingrown hair if you have coarse or curly hair. You may also experience the same situation when dead skin cells block the hair follicle. When you have ingrown hairs, you will notice a raised, red bump develop on the affected area. The bump is usually quite painful. These bumps are more common on the biking area in women and on the cheeks, chin, or neck in men. These bumps go away without treatment, but if they persist, that means an infection has developed. It actually depends on what you have done before noticing any swollen hair follicle. If you notice a swollen hair follicle soon after exiting a heated pool or hot tub, the chances are you have developed folliculitis because certain bacteria grow in these places. If you do not use heated pools or hot tubs and notice a swollen hair follicle, check if it is isolated. It is more likely to be an ingrown hair if it is isolated and you find no red, itchy bumps around the affected area. If you have swollen hair follicle due to folliculitis, you can take the following steps for relief. Always feel the direction of hair growth first and then shave in the same direction. Use a new disposable razor for shaving or opt for an electric razor. Do not wear clothes that are too tight to wear. Be sure to wash your athletic wear after use. Make use of an antibacterial soap until the infection clears up. Apply moist and hot compresses to the affected area. Try OTC topical antibiotic creams to eliminate infection and treat mild folliculitis. Wash bed lines, towels, and washcloths regularly and do not share them with others. In case you have a swollen hair follicle due to ingrown hair, you can use a pair of tweezers to pluck the hair out of your skin. While it may be tricky for some, this offers relief once you do it right. Do not forget to sanitize the area after you have plucked the ingrown hair to prevent infection. The swelling will go away once you have eliminated the problem hair. It is important to keep in mind though that sometimes the same hair keeps growing back at an awkward angle, which means you will have to pluck it several times to keep it from bothering you. Be sure to talk to your doctor if your swollen hair follicle is not due to an ingrown hair and antibiotic creams do not seem to work either. It may be due to an underlying medical condition and only your doctor can make a diagnosis after careful examination.